The hit fantasy RPG Final Blade arrived on western shores last month to much acclaim, thanks in large part to its successful mix of vibrant visuals, rich storytelling, and classic RPG mechanics. Now, the game is set to receive a whopping new update that adds a varied selection of fresh content. Perhaps the most exciting addition arriving via this update are the 4 new story chapters. Where exactly they’ll be taking us, and what sort of challenges we can expect, still remains under wraps. 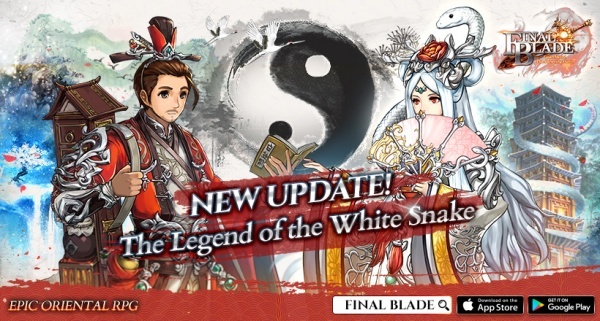 That being said, we do know that the five new characters we’ll be seeing – Susu, Xuxian, Qingqing, Mengxiao and Fahai – are all entangled in the story of the White Snake. In terms of loot, these chapters will prove to be a great way of earning that all-important 6-star gear. And if you’re looking for some fresh styles to spice up your wardrobe, the update also adds 4 unlockable costumes. In the mix, you’ve got a bunny girl costume, a school uniform, and two rather unique-looking swimsuits. Then there’s the new mode, known as Dowha Gate. Here, you’ll be required to employ your best strategies to defend the gate against an overwhelming invasion. While it may initially be reminiscent of the game’s Strategy Defence mode, Dowha Gate comes packing plenty of its own quirks and challenges. And if you do somehow overcome all the odds and find yourself victorious, you’ll be rewarded with a massively powerful 6-star hero. If you’re yet to take the epic Final Blade for a spin, this latest update just makes it all the more enticing. So I’d recommend heading on over to the App Store or Google Play where the game is available for free.